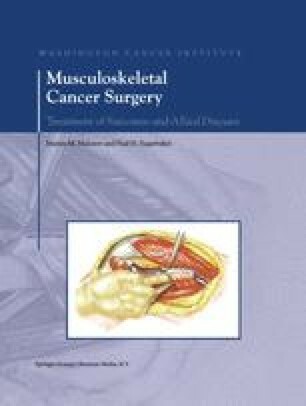 Until around 1970 amputation was the principal operation performed for bone and soft-tissue sarcomas of the extremities, shoulder, and pelvic girdle. Today 85% of these tumors are treated by limb-sparing surgery (LSS), a procedure that involves reconstruction of bones, joints, and soft tissues using endoprostheses, allografts, autografts, and composites. With proper evaluation and surgical management about 60% of these patients are cured of their underlying disease. This progress creates new opportunities for rehabilitation medicine. The purpose of this chapter is to describe major considerations associated with the rehabilitative care of patients who have undergone LSS. Specific information on surgery, principles of rehabilitation, and incidence of complications is presented for LSS surgery of the distal femur and knee joint, proximal femur and knee joint, proximal humerus and glenohumeral joint, proximal femur and hip joint, and pelvic girdle. The chapter concludes with information on LSS in children and its role in palliative care.